Have we finally moved beyond Hillary Clinton? She did it to herself, folks. And don’t be mad at Obama. Two years ago she had a double-digit lead against her rivals for the nomination and a gazillion dollar war chest. What happened? She blew it. Her campaign was so poorly managed that not only did she lose the nomination, she burned through all that money and had to dig into her own pocket and is now in debt. Thank God she and Mr. Bill took the high road out. This election is a gimmie for the Democrats. If the Democrats find a way to blow it (they still might) they should be force to disband and the new political party that rises from its ashes should not have any familiar faces at the helm. Dear London: Mrs. 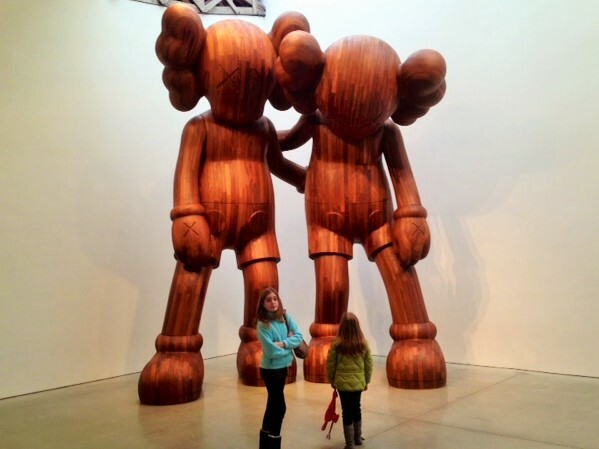 Wife and I will be in town from September 11-15. Does anyone know where I can get a pair of tickets to see Piaf at Donmar Warehouse? The entire run is completely sold out. If you have any ideas, please post. Feel free to suggest alternatives. We are big fans of the Gypsy Kings and have already booked tickets to Zorro with Bob and his entourage. Olé! 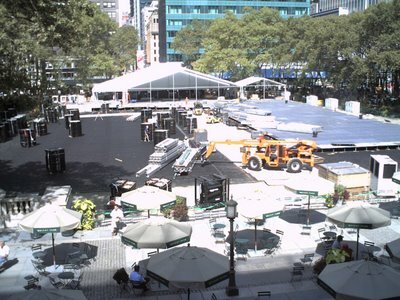 * * *They are setting up in Bryant Park for fashion week. It’s a pretty big deal out here. I have ambiguous feelings about clothiers. Fashion is a multi-billion dollar industry that pumps a steady stream of much-needed revenue into New York City coffers. But it makes its money off the vanity and insecurities of (mainly) women. It sends out a terrible message, i.e., wearing a specific label will validate you and repair your self-esteem. Runway shows look like gussied-up teen beauty pageants to me, which I also don’t understand. Modeling should be declassified as a profession and reclassified as a form of child abuse.